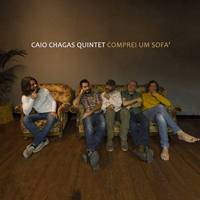 “Comprei um Sofá” is the debut album of “Caio Chagas Quintet”, a project that mix up il sound of the Brazilian music, samba, bossa nova, choro, forró, afoxé, with the influence of jazz, funk, soul e blues. Product of the meeting, in october 2014, between the brazilian musician and composer Caio Chagas and the musician/producer Chicco Montisano. Together with a team of great musicians and the sound engineering Lucio Boiardi Serri, recorded an album with 15 originals songs where the lyrics, melodies and arrangements transmit the imagination, the histories, the feelings of the composer.